Check out how to implement two-factor (or even more than that) authentication in your app. What is two factored authentication? It’s an added layer of security. Generally combining something you know with something you have to authenticate you. An everyday example will be your ATM card. You need the card itself (the thing you have), and the pin number (the thing you know) in order to use the card to withdraw money. Or you might have seen someone use a disconnected token generator (a key ring like thing that generates security tokens) to enter a security token along with their username and password to access a secure application. Now you might be wondering “OK, great. Do I put a card reader in my computer now?” You can do that. In fact, some already have done it in private, government, and military organizations. Some people even use PIN codes, access cards, voice prints, finger prints, iris scans etc., to implement two/multi-factored authentication. However, that’s not very practical if your software has users across the globe. I mean, are you going to buy all of your users specialized hardware? I know if Gmail wanted me to buy a fingerprint scanner, I wouldn't be using Gmail! Luckily there’s a simple alternative. You know your username and password, you have a phone, an email address, or a smartphone capable of running applications. We can combine them to create a two-factored authentication mechanism. When you sign in using a username and password, you can use an SMS or an E-Mail containing a generated security token that will then need to be entered to completely authenticate the user. Expensive security hardware isn’t necessary for most systems, with an obvious exception to military and high-security systems. Now it will probably take you a few days (or weeks) to create a service like this on you own, and if you are just prototyping something, or just creating a proof of concept application, or just want to cut off as much work off from your plate as possible, you will want a third party that can provide the services you want. Twilio is offering a great service for two factored authentication. They’ve named it Authy, and it provides some pretty easy to integrate services. You can use an SMS to send the security token, or the users can use the Authy smart phone application to get a soft security token. They also have a service called OneTouch, which requires an authorization for a request through the smartphone app. In case you don’t want to use their application, they provide an SDK that you can integrate into your own mobile application. Let’s create a small demo with Authy and see how we can get it to work for us. I’ll be only going through the parts that are relevant to this integration. The rest is just for the sake of app completion. You will need Node and NPM installed. I’m using some ES6 features, so I need a version of Node higher than 6. But you can use whatever you are comfortable with. You need to create an application from the Authy dashboard after signing up for their free trial. Then get the API key for the application. Then you will need to install the Authy Node SDK to get started easily. There’s nothing stopping you from directly using their RESTful API yourself, if for some bizarre reason you’d want to. Now there’s a bunch of code in the demo application that’s not really Authy specific, so we will skip that and focus on what matters. Creating a new Authy User. Now, before we can do anything, we need to register and create a new user with Authy. You need to capture a user’s country code and phone number in order to do so. You invoke the register user function in the sdk like this. Upon successful registration, the API will return an ID to identify the user within Authy. Save it somewhere! You need it later. 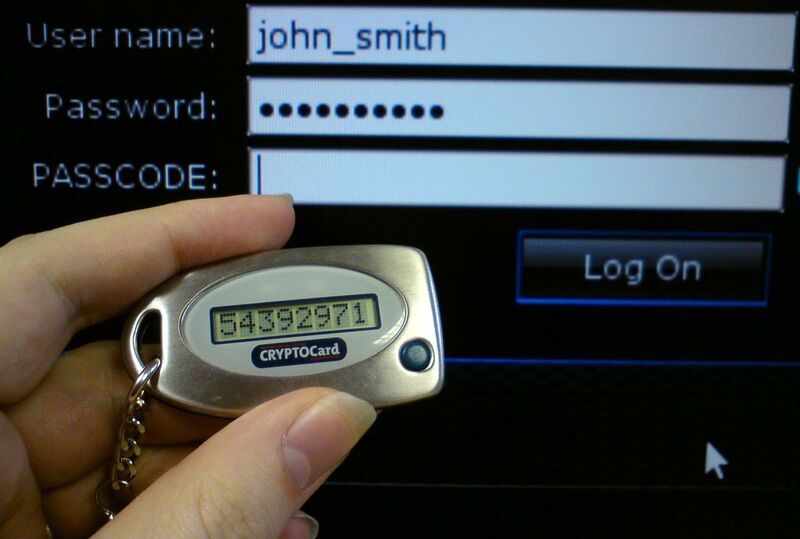 The user is setup, and he has successfully entered the username and the password, so how do you send the security token to him? This piece of code tells Authy to send a security token through SMS to the user specified by the id we saved when registering the user. If the user have downloaded the smartphone app, he/she will not receive the SMS, you can use a token retrieved by the app. There’s a setting in the Authy dashboard that will let you send the SMS regardless of the app download status if that’s what you want! console.log(err); //Invalid token is an error! Let’s see how we can use Authy’s OneTouch capabilities, to replace or complement the token-based verification. First, you need to create a OneTouch request for the user to accept or deny. The current Node SDK doesn’t really have direct support for the OneTouch API, but we can use some of its generic functionality to reduce the work we will need to do. There are two endpoints you need to be aware of. "message": "Please authorize login to the registration demo app." Note that we are concatenating the authy user id into the URL of the API. The SDK will take care of the endpoint that will be used. 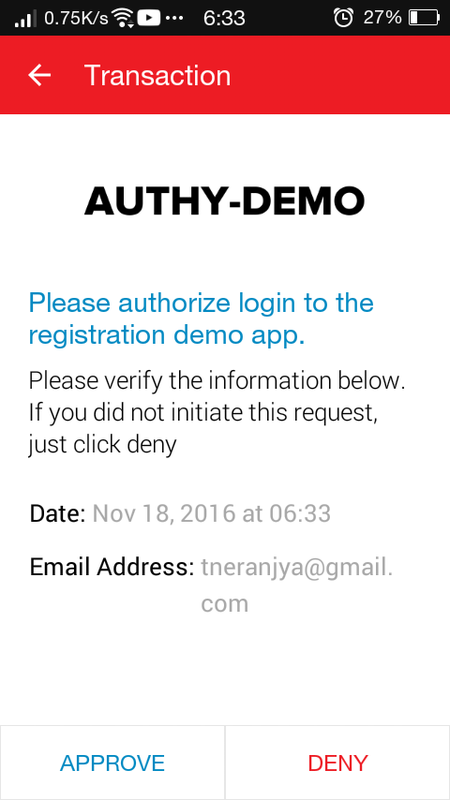 We can provide the message that will be displayed in the smart phone app when making this request, in this case, “Please authorize login to the registration demo app.”. The response from this API call will contain the request uuid (request id), save it somewhere (maybe the session?) because you will need it to check the request status. Note the message and the email address in there, that’s what we provided while making the request. Pending: User hasn’t responded either way to the request. Denied: User has denied the request, authentication is a no-go. Approved: User has approved the request, authntication complete, in you go. And there you go, integration completed. I’ve pushed the code to GitHub and deployed it on Heroku. I don’t know how long the Heroku link will work, though. I might replace it if I need to host some other application! I just love Heroku’s auto generated application names!